I've been to Tacos Bandidos a number of times, most of which are with hubby. He really adores their tacos and other line of food products. It is also conveniently located at the third floor beside the Cinemas at Harbor Point Subic, so it's just perfectly nice to have a snack there after watching a movie. Since hubby enjoyed his first dine in experience at Tacos Bandidos, he told me that we would be going back there with our two lovely kids and we did! We actually ordered a combo from their menu and it costs Php115 per order including a glass of Iced Tea or Blue Lemonade...not bad huh. Their Quesadillas are also nice especially that it's being served extra hot. 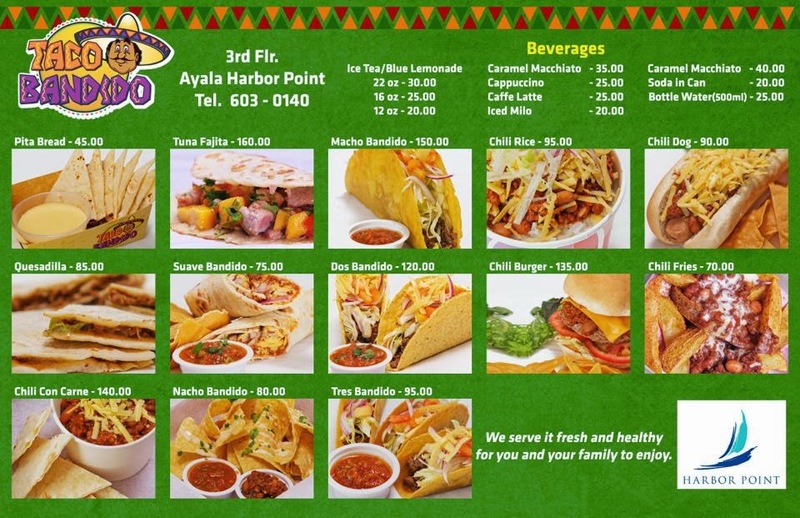 :) I think an order of Quesadilla is around Php85. The restaurant is just of a small size and the first time we went there, we've seen a number of very young couples, maybe because the lay out of the restaurant is perfect for those who are dating as you could sit on tables where no one could see you easily (lol).